HTC’s new flagship “HTC One (M8)” saw its official annoucement and launch today during an event held here in London. 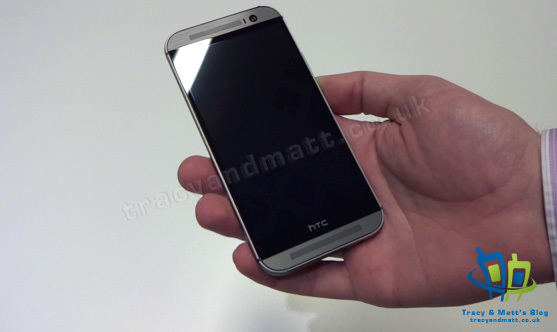 We were lucky enough to get some hands-on time with the new HTC One (M8) a few days ago and recorded an initial first-look video that you can see below. I’m hugely impressed with the new HTC One (M8) – last year’s model is now referred to as the HTC One (M7) – if you thought that last years model was well designed and engineered then you’re going to love the new one. The body is now around 90% aluminium, up from 70% previously. The boost in screen size, up to 5″ is a welcome change while the use of a slimmer bezel design and the change to on-screen menu buttons rather than off-screen capacitive buttons has enabled HTC to cram everything in to a phone that is not physically a lot bigger than the M7 model. This video is a failry short one and I will be following this up with another series of videos looking at various features in more detail so keep an eye open for those over the next day or so but check out the HTC One (M8) features and HTC One (M8) press release posts for more.